Brentford came from 3-1 down at the break to deny struggling Sunderland a second Championship win of the season. The Black Cats had only picked up four points from their past 10 matches and trailed to a Nico Yennaris tap-in. But Lewis Grabban struck an equaliser, Bryan Oviedo's corner was fumbled in by keeper David Bentley for number two and Grabban's penalty made it 3-1. Florian Jozefzoon's stunning effort got the Bees back in the game and Neal Maupay's deflected shot earned a point. The Black Cats would have climbed out of the relegation zone with a win and appeared set to do so when they went 3-1 ahead in a breathless first league meeting between the two sides since the 1992-93 season. 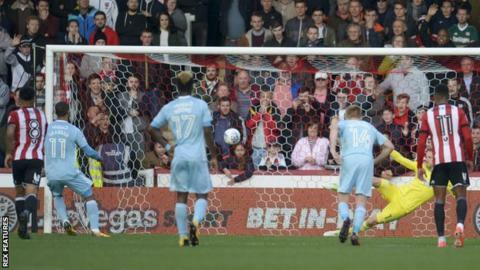 Yennaris' two-yard effort after Jozefzoon's shot hit the post simply sparked Sunderland into life. Grabban's neat low strike into the corner and cool spot-kick after Bentley's own goal seemingly put them in control. But the Bees created opportunities throughout, managing 18 efforts on goal, and Jozefzoon smashed in a superb second home goal soon after the interval. With Sunderland also struggling to retain possession, Brentford got the equaliser they deserved. Maupay struck the crucial goal, following good work by the impressive Jozefzoon, but it needed a big deflection on its way into the net. "I was angry at the break and I am still angry now because we gave them three goals. I can't remember them creating any chances apart from the ones we gave them. "It was very windy and stop-start so we couldn't get any rhythm in the game but that was no excuse for the goals we handed them, which were all the result of individual mistakes. "We got to half-time and I didn't need to talk tactics with them, but individually we needed to be better with the football. "I'm pleased they showed me a response even though I couldn't celebrate our second goal as I was still too angry. If we have ambitions to be a top-six side in this league then we need to turn games like this into three points." "We were playing quite well so not to win is frustrating and disappointing, but it was one of those games where we might have taken the point beforehand. That said, when you are in the position we were you want to go and win it. "Their second goal came from a free-kick which we thought was a good tackle from Didier Ndong but we defended well, got back into it and then the deflection allowed them back in. "We defended well and had a good shape. You have to defend well against Brentford and for large parts we did. We were decent going forward but we still have to put a few more of the ingredients together. There were signs that we are looking like a decent team. "We are three games undefeated and we are making progress. We've now got back-to-back home games to build on that, so this performance and the character we showed will give us a lift." Match ends, Brentford 3, Sunderland 3. Second Half ends, Brentford 3, Sunderland 3. Lynden Gooch (Sunderland) wins a free kick on the left wing. Lamine Koné (Sunderland) is shown the yellow card. Hand ball by James Vaughan (Sunderland). Corner, Brentford. Conceded by Billy Jones. Attempt saved. Neal Maupay (Brentford) header from the centre of the box is saved in the bottom left corner. Assisted by Henrik Dalsgaard with a cross. Attempt saved. Josh McEachran (Brentford) left footed shot from outside the box is saved in the bottom right corner. Corner, Brentford. Conceded by Jason Steele. Billy Jones (Sunderland) wins a free kick on the right wing. Attempt saved. Neal Maupay (Brentford) right footed shot from the centre of the box is saved in the centre of the goal. Assisted by Florian Jozefzoon. Andreas Bjelland (Brentford) wins a free kick in the defensive half. Foul by Lewis Grabban (Sunderland). Goal! Brentford 3, Sunderland 3. Neal Maupay (Brentford) with an attempt from the centre of the box to the bottom right corner. Assisted by Florian Jozefzoon. Attempt blocked. Florian Jozefzoon (Brentford) left footed shot from outside the box is blocked. Assisted by John Egan. Callum McManaman (Sunderland) wins a free kick on the right wing. Substitution, Brentford. Neal Maupay replaces Lasse Vibe. Attempt blocked. Josh McEachran (Brentford) right footed shot from the centre of the box is blocked. Assisted by Ollie Watkins. Didier Ndong (Sunderland) is shown the yellow card for a bad foul. Offside, Brentford. Josh McEachran tries a through ball, but Florian Jozefzoon is caught offside. Substitution, Brentford. Josh McEachran replaces Romaine Sawyers. Substitution, Sunderland. Callum McManaman replaces Duncan Watmore. Offside, Sunderland. Duncan Watmore tries a through ball, but Lewis Grabban is caught offside. Attempt missed. Lasse Vibe (Brentford) header from the centre of the box is high and wide to the left. Assisted by Henrik Dalsgaard with a cross. Attempt blocked. Ollie Watkins (Brentford) right footed shot from the left side of the box is blocked. Assisted by Nico Yennaris. Attempt missed. Aiden McGeady (Sunderland) left footed shot from the left side of the box is close, but misses to the left. Assisted by Lee Cattermole. Corner, Brentford. Conceded by Bryan Oviedo.